An easy walking tour in rural Gifu and Nagano Prefectures with strong emphases on onsen hot springs and Japanese gastronomy. Guided, gentle walking through picturesque towns and rural vistas. Charming historic towns surrounded by soaring mountain scenery, a beautiful high plateau, ancient shrines, and spectacular waterfalls. 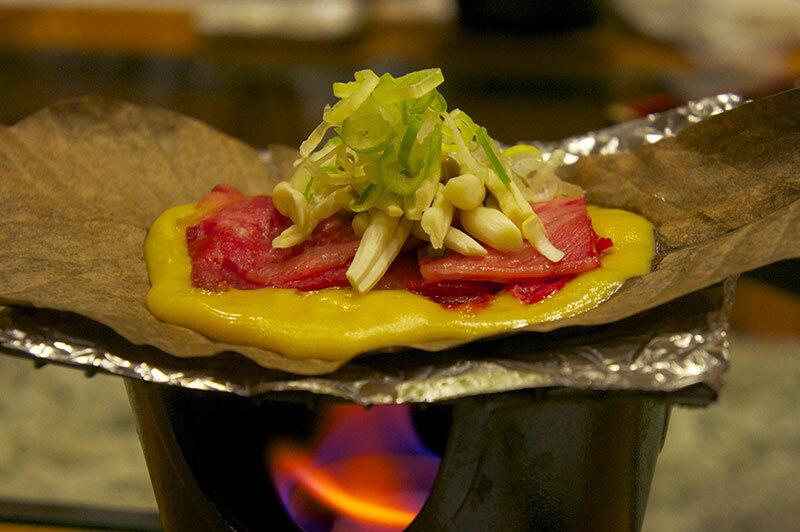 Light walking combined with plentiful onsen hot spring baths and opulent cuisine. Accommodation in Japanese inns. 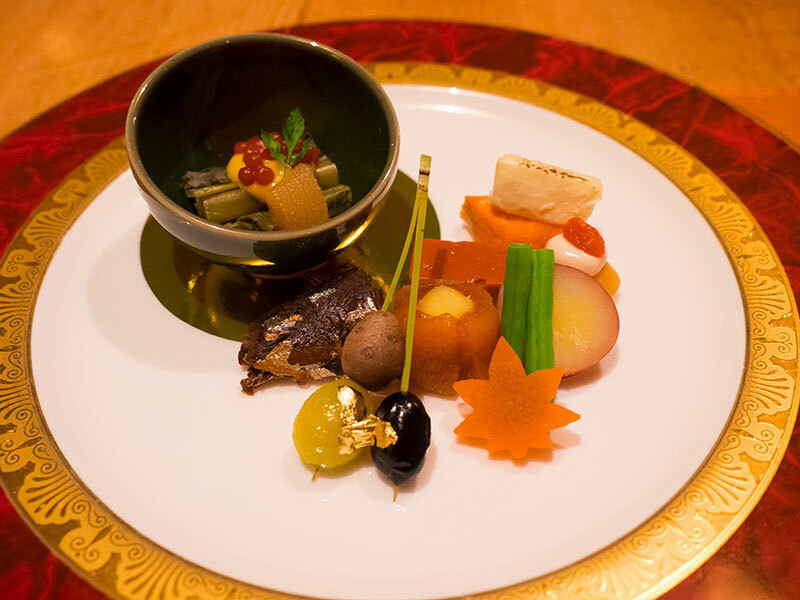 The Onsen Gastronomy: Gifu & Nagano tour is a fully guided tour suitable for moderately active people who can walk comfortably for up to 3 hours a day. The route is mainly on pavement, grassy paths and quiet country roads. The terrain is generally even underfoot and over mostly flat or gently rolling countryside. It also includes a few short inclines that can be completed in five minutes or less. Please read more on Tour Levels here. A five-day, four-night tour starting in Nagoya and finishing in Kiso-Fukushima. Accommodation is in Japanese inns, all but one with onsen hot spring baths. The small, intimate nature of the tour makes the maximum group size 12 people. We have no minimum size. If we accept a booking we guarantee to run the tour. This fully-guided tour visits central Gifu and western Nagano Prefectures in the geographic centre of Japan; a largely remote area of mountain ranges, deep valleys, high plateaus, remote villages and lovingly cared-for period towns. A richly forested hinterland far from the oceans; the local cuisine is deeply rooted in rustic hardy but delicious fare, which together with the region’s onsen hot springs provide us with a delightfully, symbiotic sustenance. The tour starts in the morning on Day 1 at Nagoya Station, where the Walk Japan tour leader meets the group. We quickly transfer together to the homely, old castle town of Gujo-Hachiman, where the locals, which includes a retired sumo wrestler, are as much a focus of our visit as the town itself. Our first onsen of the tour is most unusually at a rural railway station. We have already journeyed a long way into Gifu’s mountainous countryside and venture still further to a remote shrine and post-town on the route of an ancient, yet now little-known, pilgrimage to sacred Haku-san, a dormant volcano. Here, a local villager takes us on a guided stroll into the life and history of this secluded and beautiful district. This night’s onsen are within our accommodation as en suite baths. On Day 3, we find ourselves in Takayama, which, for some very attractive reasons, is a popular destination for visitors both Japanese and overseas. Takayama’s roots as a strategic outpost of the ruling shogun in the Edo Period (1603-1868) is reflected in its historic townscape. We savour an easy stroll around the town, sometimes to the more popular streets, but most often to much less-visited, quieter quarters that provide us with insights into life in the days of the samurai. En route, we enjoy lunch in the company of a very amiable hostess in her atmospheric restaurant. Afterwards, stomach willing, we find taste some local morsels at roadside stalls. Finally, we cross the border into Nagano Prefecture and on to Kaida Kogen, a quiet rural plateau considered one of the prettiest areas of Japan. Ontake-san, an active volcano, soars over Kaida Kogen and provides us with a dramatic backdrop to our amble here and our accommodation, a family-run onsen inn. 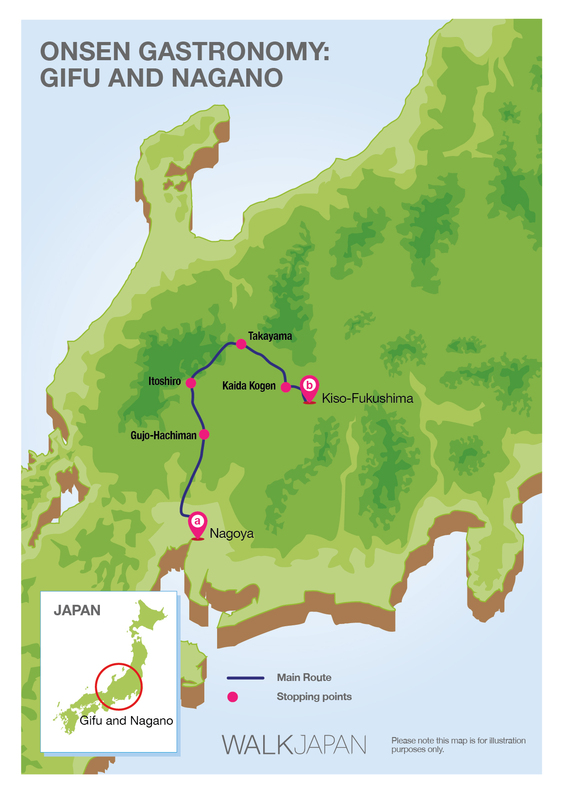 We complete our journey together in nearby Kiso-Fukushima for easy rail connections to Nagoya and the rest of Japan. The itinerary for the Onsen Gastronomy: Gifu & Nagano tour is ground only beginning in Nagoya and ending in Kiso-Fukushima. Prior to the tour, Walk Japan will provide detailed instructions for travelling to the meeting point at Nagoya Station. The tour starts in the morning at Nagoya Station, where the Walk Japan Tour Leader awaits everyone’s arrival. From here we transfer by private-hire vehicle on a 90-minute journey to Gujo-Hachiman, an old castle town set squeezed between towering mountains. 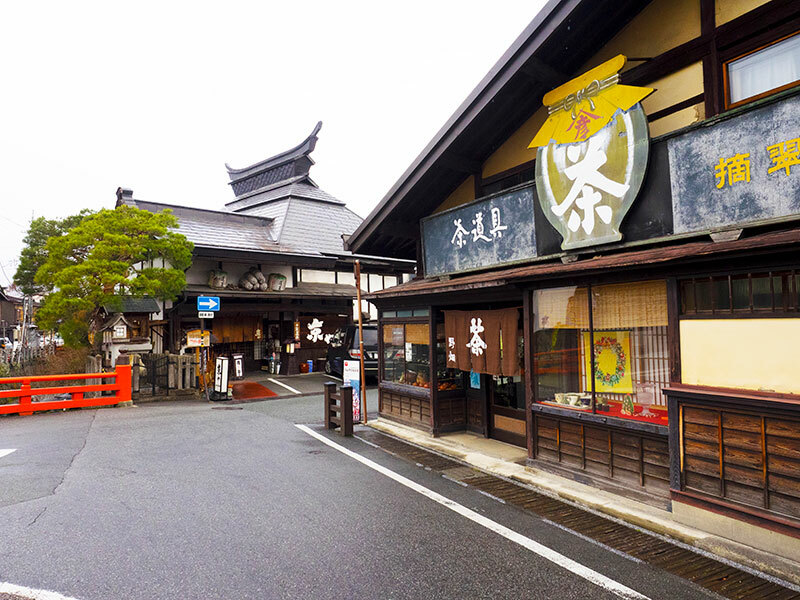 A compact and pretty town with quiet narrow lanes, Gujo-Hachiman provides us with a delightful exploration on foot. The town, with its closely packed, well-maintained houses and streetscape, has a warm and genteel atmosphere, which is reflected in the friendliness of the residents. Gujo-Hachiman is set at the confluence of three rivers, which we continually crisscross on our perambulations together. At times we also follow the course of channels that gush with fast-flowing pristine water drawn from the surrounding mountains to and throughout the town. Built many hundreds of years ago to provide a ready source of water in case of fire, today the channels are used to wash rice and vegetables while colourful koi carp languidly swim to and fro. We enjoy lunch of seasonal local fare aside a river at an atmospheric restaurant and afterwards visit a replica food emporium. Unexpectedly, given its old-world charm, Gujo-Hachiman is the centre of Japan’s plastic food industry and we try our hand at making some tasty looking but inedible morsels. Before checking into our accommodation in the centre of town we make a short journey south aside the scenic Nagaragawa river by local train to the first onsen hot spring bath of our tour, which we find, unusually, at the railway station we disembark at. This evening we dine out at a restaurant specialising in chanko-nabe, the dish favoured by Japan’s famed sumo wrestlers. Our host is a retired wrestler and, as we dine, introduces us to life in the world of sumo while plying us with some of the best sake produced in the region. After breakfast we stroll to Jionzen-ji, a temple celebrated for its beautiful Zen garden centred on a pond into which tumbles a waterfall. Although known for its colourful foliage in the autumn, the garden is magnificent throughout the year. A private-hire vehicle whisks us up to Gujo-Hachiman-jo, the town’s castle sited on a hill peak. From here we are afforded expansive views over Gujo-Hachiman and the surrounding countryside. We once again follow the beautiful Nagaragawa river valley, this time north, to Shirotori where we visit the 1,300 year-old Nagataki-jinja, a shrine where pilgrims to sacred Mt. Hakusan would leave their horses and continue on foot. The shrine’s priest, the latest generation of one of Japan’s oldest families, relates to us the ancient history of the pilgrimage. The pilgrimage is for the worship of water, which is the main theme for our day today; we enjoy lunch of ayu sweetfish, caught in the clear waters of the local river, and stop by a sake brewers, which draws on a fresh water spring to create Japan’s traditional libation. 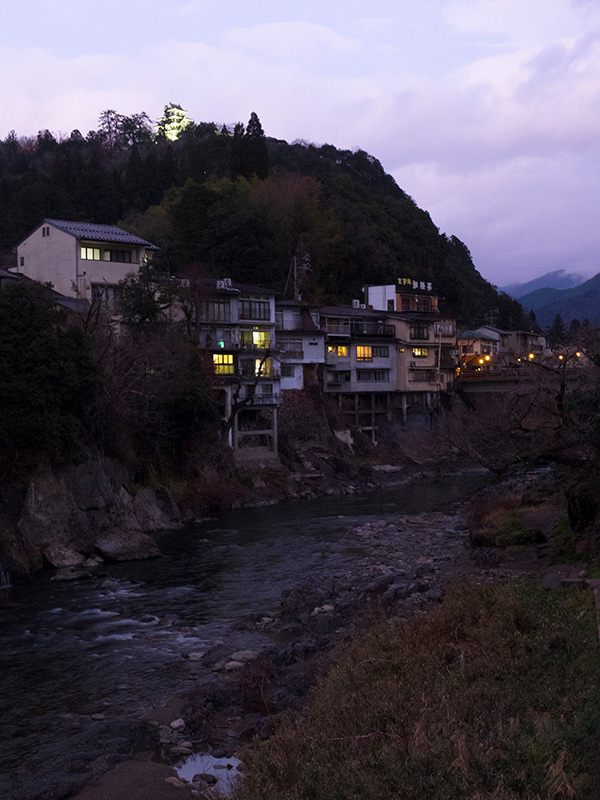 We travel a little further into the mountains to Itoshiro, an old village that once provided lodging for pilgrims to Mt. Hakusan. Here a local resident joins us and in their company we enjoy a leisurely guided exploration of this quiet, pretty, rural community. Although Itoshiro’s inns have long closed, nearby we find an upmarket, modern inn with en suite onsen baths. After a leisurely soak in the soothing hot waters we enjoy a multi-course lavish evening meal accompanied by sake from the brewer we visited earlier today. Total walking: 4km (2 miles). Total elevation gain: 77m (252ft). We board a private-hire vehicle for our journey to Takayama. Briefly continuing yesterday’s water theme, en route we stop for a short stroll to Amida-ga-taki, one of Japan’s most beautiful waterfalls. The verdant forests and the crystal clear water tumbling over a 60-metre high precipice provide us with a spectacular and invigorating experience. Takayama is a 60-minute journey away and we arrive in time for lunch. In an atmospheric restaurant housed within a traditional building we savour local farmhouse cuisine. Our hostess and her staff welcome us with a friendly gracious air and ply us with a multitude of tasty dishes. Satiated, we enjoy a gentle stroll around Takayama, an historic and popular regional city. Our walk takes us on a mostly off-the-beaten route around the old city centre and en route, stomach willing, we stop at stalls for a sample or two of bite-sized, delicious morsels. In our accommodation, our now familiar evening routine begins; a relaxing soak followed by another delicious Japanese banquet. Total walking: 4km (2.5 miles). 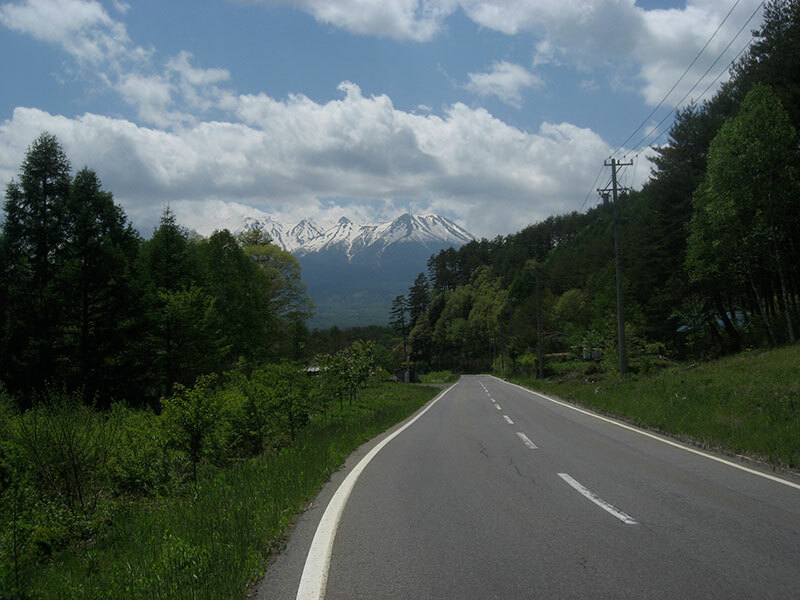 After breakfast, we travel by vehicle across the prefectural border to Nagano and Kaida Kogen, a beautiful rural plateau dominated by Ontake-san, an active volcano. We begin our walk today at the top of Jizo-toge, a mountain pass deep in the plateau’s surrounding forests. However, before starting our stroll across the plateau we fortify ourselves at a boutique purveyor of handmade ice cream. Kaida Kogen’s farmers specialise in growing soba buckwheat, a tasty and very nutritious grain, and we enjoy lunch at a restaurant excelling in soba noodles dishes. This afternoon, we have the option to walk an additional 3km through forests up to a hilltop where, on a clear day, we have tremendous 360 degree views over the plateau to the surrounding mountains including Mt. Ontake. We descend from here to our accommodation, a lovely, family-run Japanese inn with the necessary requirement of onsen baths and a splendid view of Mt. Ontake-san. After breakfast, we travel to Kiso-Fukushima, from where onward journey by train to Nagoya, Tokyo and Kyoto is easily accomplished. The Walk Japan Tour Leader will be on hand to assist you with travel arrangements. The itinerary for the Onsen Gastronomy: Gifu & Nagano tour is ground only beginning in Nagoya and ending in Kiso-Fukushima. The airport closest to the tour’s start at Nagoya is Nagoya’s Central Japan Airport. Transport is also easily made from Osaka’s Kansai International Airport and both Tokyo’s Narita and Haneda International Airports. From Nagoya’s Central Japan International Airport Meitetsu Line trains depart for Nagoya. The journey costs about JPY1,340, per person and takes approximately 40 minutes. From Osaka’s Kansai International Airport Haruka Express trains depart to Shin-Osaka Station, where Shinkansen bullet trains then depart for Nagoya. The journey costs about JPY8,300 per person and takes approximately 2 hours. From Tokyo’s Haneda International Airport Keikyu Line trains depart for Shinagawa Station, where Shinkansen bullet trains depart for Nagoya. The journey costs about JPY11,090 per person and takes approximately 2 hours. From Tokyo’s Narita International Airport Narita Express trains depart for Tokyo Station, where Shinkansen bullet trains depart for Nagoya. The journey costs about JPY13,470 per person and takes approximately 3 hours. Tour participants are advised not to book themselves out on an early morning flight at the end of the tour, as the journey from Kiso-Fukushima to the nearest international airport takes approximately 3 hours 30 minutes. Included: Walk Japan tour leader; 4 nights' accommodation; 4 breakfasts, 4 lunches and 4 evening meals; selected drinks with evening meals; dedicated support vehicle on one day, luggage transfers; entrance fees; travel from tour start point to tour finish point.